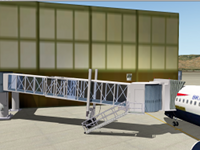 This scenery package adds a selection of animated jetways and docking guidance systems to the terminal at KSBD. 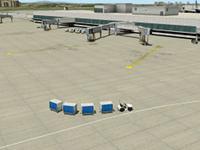 This scenery package adds a selection of animated vehicles to KSEA Seattle-Tacoma airport. 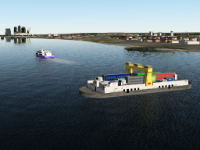 This scenery package demonstrates how to replace the SeaTraffic plugin's default ship models in a given area. Blender is an open source 3D object editor for Windows, Mac and UNIX. 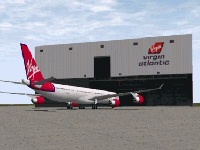 This tutorial guides you through the process of creating an X-Plane scenery object - the Virgin hangar at London Heathrow - using Blender. No prior knowledge of X-Plane internals or Blender is assumed. 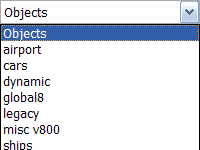 X-Plane ships with a number of scenery libraries. This mini-tutorial shows you how to use library objects in your scenery packages, and how to create your own libraries. These files illustrate how to make animated objects in Blender. Contains a throttle, yoke and a stick. This file illustrates how to construct various types of X-Plane lights in Blender. These files illustrate how to make animated objects in SketchUp. This file illustrates how to construct various types of X-Plane lights in SketchUp.